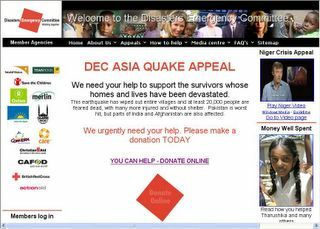 Click on the screen shot (above) to go to the DEC website and make a donation. This earthquake has wiped out entire villages and at least 20,000 people are feared dead, with many more injured and without shelter. Pakistan is worst hit, but parts of India and Afghanistan are also affected. Many of the people involved live in isolated communities, cut off and desperately in need of help.